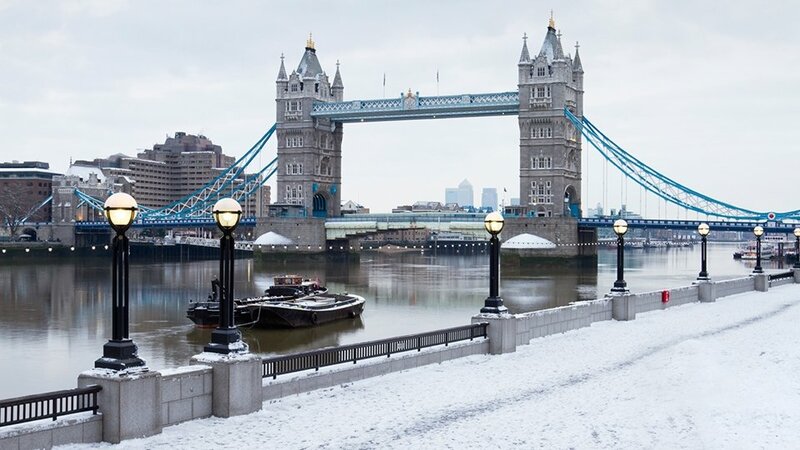 From the fresh spring blooms to the winter's first snowfall, every London season is stunning. Pack smartly and be ready to explore no matter what the weather brings with our helpful seasonal guide. While London does experience four separate seasons, light showers and cloudy skies are prevalent throughout the year. Daily highs range from 48°F (9°C) in the winter to 73°F (23°C) in the summer, and weather conditions can fluctuate quite a bit over the course of a day. To get a better idea of what kind of weather you can expect on your trip to the UK capital, take a look at the following table, which lists the city’s monthly average temperatures and rainfall days. Each season in London showcases the city in a different way. Overflowing with blossoming flowers, spring reveals the UK capital at its most colorful. Long summer days show off a brighter side to London, while rich hues of orange, red and yellow make autumn irresistible. Come winter, the city’s streets and parks light up in a festive display that is a feast for the eyes. As London transitions from winter to spring, the weather can vary from warm and sunny to cold and rainy. On average, daily highs range from 53°F (12°C) to 64°F (18°C) with lows between 43°F (6°C) and 55°F (13°C). When packing for a trip to London in the spring, bring a warm jacket and some layers so you can easily adapt to the changing weather. Summers in London are generally mild and pleasant, but not without occasional rain showers. Day are long with high temperatures around 70°F (21°C) to 73°F (23°C) degrees and lows around 59°F (15°C). While you can leave the winter wear at home, we recommend packing a light jacket or sweater for chilly summer evenings. Warm summer weather usually lasts through September before the temperatures begin to drop sharply in October. Expect highs ranging from 68°F (20°C) down to 53°F (12°C), with lows around 50°F (10°C). Autumn is usually London’s rainiest season, so be prepared for wet weather! Winters in London are characterised by cold and often rainy weather. The average high between December and February is 48°F (9°C) and the average low is 41°F (5°C). However, freezing temperatures are not uncommon and snow is not unheard of. Be sure to pack a winter coat along with a hat, gloves and scarf.